Amino acid-chelated magnesium and calcium in perfect balance (half as much magnesium as calcium) is the preferred form. Available in multivitamin and mineral preparations. Magnesium supplements can be purchased as magnesium oxide. 250 mg strength equals 150 mg per tablet. Magnesium supplements are commonly available in 133.3 mg stregths and taken four times a day. Help burn fat and produce energy. Promote a healthier cardiovascular system and help prevent heart attacks. Help prevent calcium deposits, kidney and gallstones. Combined with calcium can work as a natural tranquilizer. When you may need magnesium supplements? If you are a drinker, we suggest you to increase your intake of magnesium. If your daily workouts are exhausting, you probably need more magnesium. Women who are on the pill or taking estrogen in any form should eat more magnesium-rich foods. Supplements of magnesium should not be taken after meals, since the mineral does neutralize stomach acidity. However, magnesium supplements should be taken with meals. 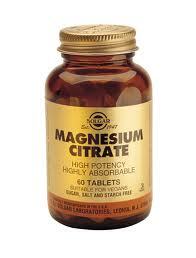 Taking magnesium supplements on an empty stomach may cause diarrhea. Magnesium works best with vitamin A, calcium and phosphorus.